Drilling miles underground? Pumping water in under pressure? Now I wonder where I heard that before? Drilling work is beginning at what may become the first deep geothermal power plant in the UK. Two wells will be drilled 2.8 miles (4.5km) and 1.5 miles (2.5km) into granite near Redruth, Cornwall, where the temperature is up to 200C (390F). It is thought that the 2.8-mile deep hole, which will take seven months to finish, will be the deepest ever drilled in the UK. 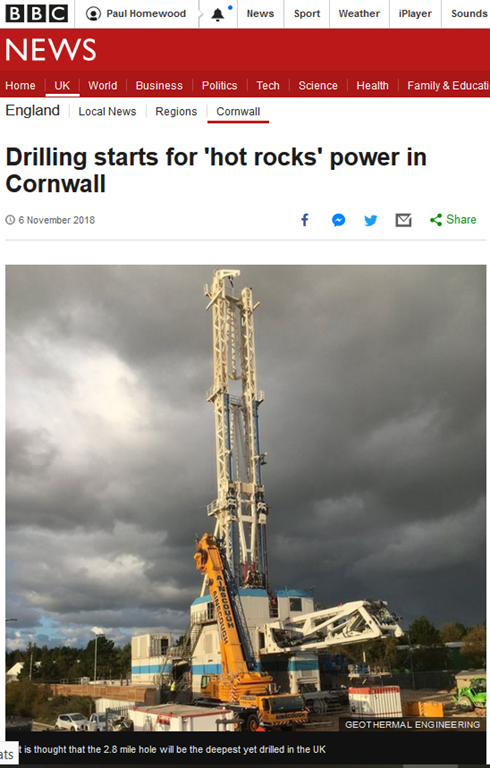 The heat-producing properties of the granite rocks under Cornwall mean the county is an obvious choice to exploit geothermal energy, say engineers behind the project. Energy firm Geothermal Engineering says the key issues will be whether the rocks are permeable enough to get the water through and enough heated water can be extracted to drive the turbines. The Eden Project near St Austell and the Jubilee Pool lido in Penzance are also currently undertaking similar projects. How does hot rocks energy production work? The £18m project has received £10.6m from the European Regional Development Fund, £2.4m from Cornwall Council and £5m from private investors. 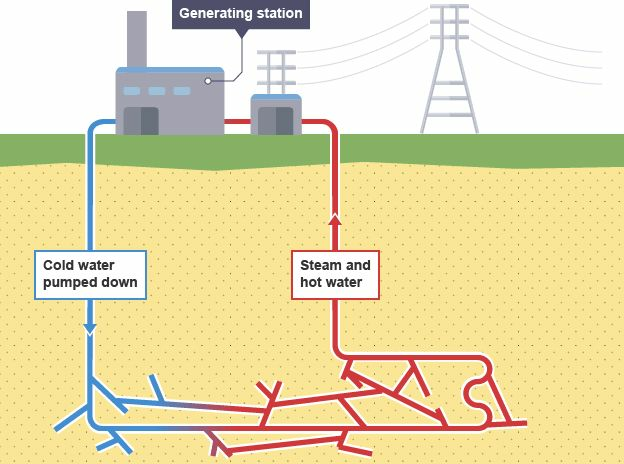 Geothermal Engineering claims geothermal power could deliver "up to 20%" of the UK’s electricity and heat energy needs "in a reliable and sustainable way". Managing director Dr Ryan Law said: "It is incredibly exciting to see this pioneering project getting off the ground in what we hope will be the start of many similar initiatives across the UK." I wonder where all of the Greenpeace protestors are, complaining about lorries, noise and earthquakes? Not to mention their acolytes at the BBC. Still, it’s funded by the EUSSR, so it must be “good”! Yes Paul, I had exactly the same thoughts this morning when it was on the Radio 2 news for a few seconds. High time Rentacrowd left-liberal opinions were not allowed to interfere with progress, but we need a Government and PM with good judgement and common sense, which are not our present lot’s strong suit. Time for Th. May to bow out. Sorry you won’t get that from the Socialist Conservative Party. Agreed: most of our politicians in Holyrood are even less insightful on most questions than most of those in Westminster, and that is saying something. but G.O.K. what could be done, short of a “benign” revolution by those with more common sense and public spiritidness. And just how much per kwh will they be charging the leccy companies who now have a cap on their prices? Although they state that the cap may have to rise in April ! And the April after that and that and that and………….. Surely this is just fracking for geothermal heat. I wonder where this plant is going to get all that water from? Have these people also considered the problems other geothermal site have had — like bring up subterranean hazardous material such as arsenic, boron, and mercury to the surface? Or what they’ll do if they hit a large gas pocket of methane, hydrogen sulfide, or any other noxious gas? Radon a known hazard from the rocks around Cornwall (see https://www.cornwall.gov.uk/environment-and-planning/environmental-protection/environmental-protection-radon/ ). Southampton runs a scheme for heating some buildings and the hospital, and as a far less ambitious scheme looks like a success. See https://www.wessexscene.co.uk/magazine/2017/11/30/southamptons-geothermal-pursuit-a-success-or-failure/ for more. But overall the EU is fully behind such power generation, so it must be suspect. The printed edition of today’s Daily Mail mentions “Naturally occurring radioactive elements in granite 2.7miles below the site will heat the water”. granite contains uranium which heats the rock. But you should let Greenpeace know so they can ban the project, won’t they? “Howler” is too weak a word for this. However, slightly off-topic, the familiar story of the earth being hot because of billions of years of fission is, in any case, not true. The heat in the earth is residual heat from gravitational compression. I am sure some people remember that committed Christian physicists such as Lord Kelvin and Maxwell attacked geologists and evolutionary theory (which was the real target) by asserting that the earth could not be old enough for “gradualism” to do its work. And this was based on the rate of cooling of a rocky body. * But lo and behold an unsuspected internal source of heat was found in radioactivity. The geologists were right. What nobody remembers is that the calculations of the dogmatic physicists** were completely wrong because they did not allow for the REAL unsuspected source of heat in the outer parts of the earth, TRANSPORT by CONVECTION from the interior. Radioactivity has very little to do with the matter. * It was actually a calculation based on the heat gradient near the surface. Kelvin knew perfectly well that a calculation which allowed for the whole store of heat in the earth to come into play allowed for an old earth. ** Non-dogmatic physicists pointed out the errors almost at once but this was not a “convenient” finding. BBC 6 o’clock news ran this story and included a sideswipe at fracking. Can’t remember the exact words but something along the lines of “this will be a completely clean operation with none of the environmental risks of fracking”. Always an agenda to be pushed, and yet the Corporation is supposed to eb neutral. Sounds like a great idea, but the problem is the cost. We had a large pilot plant here in Australia, but it was closed because it was financially unviable even with the subsidies it was getting. The company Geodynamics changed its name and moved into conventional solar. Does anyone know what the yield of such installation is ? It does need energy to circulate (“pump down”) water. Surely if the rock temperature is only about 200 degrees C it is going to be very low power as conventional steam turbines run at much higher temperatures? Is this really an economical way to produce electricity or would it be better used for heating? “Is it really an economical way to produce electricity”? NO. Is it an economical way to produce grants and subsidies? YES. I recall a similar scheme at Rosemanowes quarry in Cornwall about 35 years ago that I think was considered a failure and unlikely to produce electricity at economic prices. The quake ruined much of Pohang, caused dozens of injuries, and destroyed the homes of 1,500 families. It sounds like a good idea but I still don’t get quite how it works. For example, whats to stop the pressure form the super heated water/steam backing up the cold water entry pipe? But this has been done before — in the 1960s I think. It was abandoned as it was found that once the heat was extracted in the part of the rock closest to the working, the area became cold. It was news at the time but I suppose it’s a long time ago for snowflakes…! It was done I think by the Camborne School of Mines which was a world famous institution then. Note to self: If the BGS decide that a baseline of 2.0 is adequate for monitoring, and hadn’t been pushed into using ‘ultra-sensitive’ detectors, I wonder just what they would be reporting from Blackpool? (Silence). Ryan Law finds it incredibly exciting. Spending other peoples’ money on his own daily consulting rate I’d guess. I suspect he has a spinning bowtie and $ signs on his eyelids. Pioneering? Not really. We evaluated this type of process in 1982 using data we obtained in a tight gas fracturing project we were doing in +400 degF rocks. The transient heat transfer rates made it look good but when we took a hard look at the steady state heat transfer rates we shut the book and shelved it. Since then people have lost money to the spin doctors. These things just keep popping up and people who can’t do engineering heat transfer maths or understand the difference between transient and steady state conditions keep getting sucked in. Has this site been infected? It keeps giving me a pop up for a prize which is difficult to get to disappear. No other sites do the same thing. Drilling down for hot rocks…………..it ain’t viable, as many other posters on here attest and indeed: some good points made by all. ref Iceland and utilizing their ‘hotspot’, its abundant thermal springs is quite a different matter of course, unfortunately for us, the loons in UK government and their sock puppets, the green eco maniacs quite erroneously conflate the twain. Not entirely as they have hit one problem that will certainly be an issue – namely you are effectively watercooling the rocks. And even in hot Iceland they know that there is only so much energy you can extract before the temperature gradient starts to reduce. This scheme looks marginal from the start evidenced that private cash is hardly tearing in to fund it. I wonder if the private cash is from dumb virtue-signallers anyway or from renewable spivs who smell a source of taxpayer cash. With respect mate, the thermal springs in Iceland don’t need any drilling nor man made coaxing, nature does all of that, once it comes to the surface, then, yes, man does the pumping and natures high pressured vent steam turns the turbines, in turn, generates the lecky and warm water on tap. As with all things free, it is the cost of harvesting it that hits the wallet. And what will they do with all the radioactive waste? Vent it to the atmosphere, and have the prevailing winds blow it acrioss the whole country? I am sure the greens will support that. Not. Or they will just ignore it. Ostrich tactics. They are drilling in granite FFS. The stuff that you need special care with, if your house is built on it, because the cellar fills up with radon. Readers of the Jonova site will have come across the name of Flannery a self nominated climate scientist (but unqualified in that expertise) who persuaded the Australian Govt to invest 90 M Aus dollars in a geothermal initiative that totally failed. If the media story is correct Flannery was a shareholder of the company that received the taxpayer’s money. I predict that this similar initiative in the UK will follow the same route : lots more money from Clair Perry, urged on by BBC – failure of project – no recompense for taxpayers. The report is partially true — the actual public funding was $107 million, not $90m. To say it was not financially viable is the understatement of the century. It was not TECHNOLOGICALLY viable. Hot rock technology should not be confused with geothermal power generation. In geothermal, the hot water is there waiting to come to the surface, and frequently forcing its way to the surface violently; in hot rock technology, water must be forced down into rock that has been artificially fractured, then somehow extracted back to the surface for the heat to be harvested. The problem arising is that they have been unable to get their hot water back out of the fractured rock. Hot Rock technology that was going to provide Oz with unlimited free power from the heat of granite beds was abandoned after $107 million in grants to the company, but not before its directors gave themselves $400K annual salaries for a few years. The taxpayer money flowed like water to all and sundry. An ABC news crew managed to capture one puff of steam for a minute right on cue — the only puff produced in 6 years. Very convenient. Tim “the dams will never fill again” Flannery was a director and chief spruiker for that con job. The anathema of fracking is apparently admirable when applied to hot rock technology rather than gas extraction. Geodynamics Ltd received the Clean Energy Council Innovation Award in 2013 for its hot rock technology . . . that didn’t work then and still doesn’t. Geodynamics 2007 share price: $2.10; share price 2017 . . . $0.01. Share prices are not indicative of success in the world of renewables however — what really counts is how much public money can be siphoned off before a subsidised project collapses. Like all renewable projects it was announced with a blare of trumpets and headlines, and wild claims of what it would achieve; like all futile renewable projects it was discreetly shut down with not a whisper about its abject failure or what had become of the hundred million public dollars lavished upon it. When you said unqualified did you refer to the climate aspect or the science side? Not that it matters.He is perhaps ‘qualified’ as a climate predictor e.g. you may not have heard that Perth has been abandonned because the city ran out of water, the population of much of northern Australia has fled from the searing heat, and that Sydney Harbour now laps the top of the foundation (6 metres high) while Tim bravely stays at home in his water-side house. Still, his financial position has been enhanced. Of course Iceland, the Azores, New Zealand, Hawaii, Japan and other places have extracted useful energy from geothermal sources for years. However, I’m unsure about the economics unless heavily subsidised. But with all the active volcanos in Cornwall, this project must be a certain investment. Almost as promising as massive solar farms at 54 degrees latitude. !hey throw in a tidal lagoon or two!! “ooh, and OUCH this is gonna hurt you more than it is us” they giggled and all the way to the bank of UK idiot consumers – you voted for it. I don”t recall being asked to ,vote for it’. I’d have voted agin it if I had! liblabcon, imposes the green agenda, we didn’t ask for it, I don’t vote for it but we get it anyway and until people stop voting for the aforementioned, named political parties – that is what they get. The EU presides and orders by diktat, the Westminster prats install thus and UK energy policy becomes FUBAR. It’s just what the Germans require.